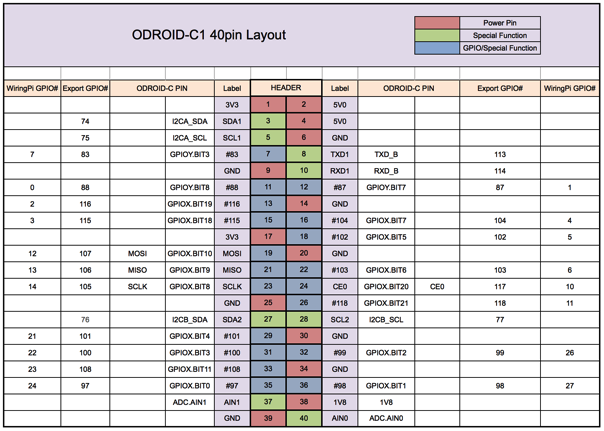 I think odroid c1 is quite compatible with raspberry gpios (wirepi works in it for example). I'm not expecting to work without modifications, but maybe someone has tried it yet and could save me some time. Have anyone tested it? Any advise to take in mind? OK. I'm making small progress. Nothing amazing but I have not yet my nrf24. I'm using as base the orange pi zero getaway howto. As I can see spidev is now supported in mysensors so i did this untill now. @dantefff Nice. Let me know when your module arrives, and you start testing with it. @dantefff are you sure the pin numbers are correct? can you connect a LED and test if it's the right numbers? Yes, an LED with a resistor. Then try to turn it on and off. But maybe that is not even necessary. Besides, the pin numbers you mentioned seem quite odd, but I do not have experience with the C1. Which are the WiringPi pin numbers. If you're not sure, the already mentioned LED test can help by switching on/off the concerned "files". Yes, SPI pins should not light. I am at the end of my knowledge here, sorry. Next step would be connecting an oscilloscope to see it anything omes out the SPI interface and the selected pins.